NAU is the platform that unites retailers with customers community, using blockchain technology. 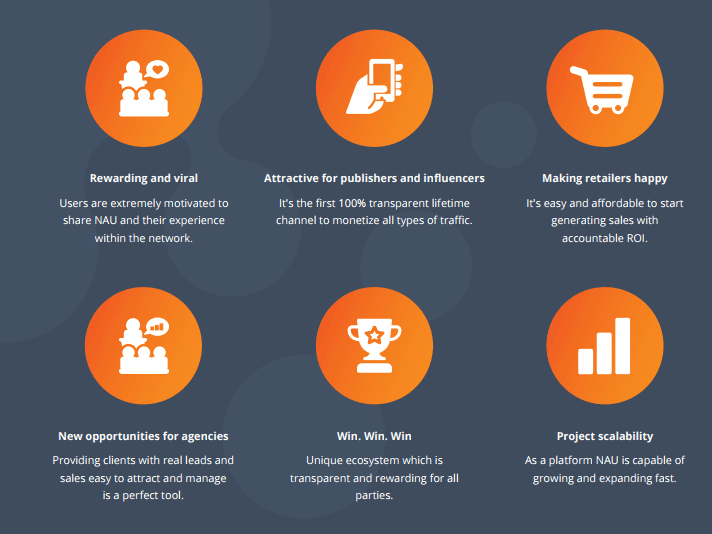 By enabling every user to be an affiliate to any retailer, NAU encourages consumers to spread the word about the platform, creating a unique ecosystem where each user is an avid ambassador/influencer who is rewarded by the retailer for creating sales. Retailers, in turn, get access to highly-targeted local audience and pay only for leads which deliver sales. Besides being a customer redeeming exclusive offers from retailers, any user can be their associated affiliate partner. Their vision is to be the best implementation of the once popular SoLoMO (Social, Local, Mobile) marketing approach. Nau will create a fair and mutually beneficial platform where retailers can comfortably get additional sales based on transparent and affordable price while directly rewarding those who make these sales possible – the affiliates. The main point of entry to NAU Platform is the mobile app with geolocation module. It allows users to find the retailers and specific offers to redeem. NAU already has local offices in Germany, Philippines, Colombia, Russia and Ukraine and has started signing up retailers for the initial platform deployment. Digital advertising has disrupted the industry and continues to do so. The Cost-per-Action (CPA) model has made efficient advertising possible for many businesses who previously wasted substantial parts of their budget paying for marketing presence only. However, in many countries, local businesses have no access to this CPA model, due to the high cost of market entry. For example, a laundry in Manila, a coffee shop in Bogota, a family grocery in Augsburg, a barbershop in Odessa and pet clinic in Novosibirsk may only have access to traditional advertising and marketing services such as billboards, flyers, local radio and press. They may not have the expertise or access to online tools like social networks or contextual advertising. There is no easy way to measure their return on investment (ROI) or their Customer Acquisition Costs (CAC) effectively through traditional or digital advertising channels. Digital coupons seemed to be a very promising solution when they first appeared and started gaining popularity both among users and retailers. What seemed to be a great concept for attracting customers for local businesses, was undermined by the sheer level of discounting required to be featured. For example: retailers are forced to give insane discounts to get featured and additionally must pay up to 50% of the discount to the service provider as a commission, therefore bringing the effective discount to 90%. What starts as a loss leader becomes unsustainable for retailers resulting in most never using this marketing tool again. The concept of saving and getting bonuses is very popular with consumers both in well-developed and emerging markets. A direct business-customer platform, which removes middlemen who do not add value to the transaction, is the next step of digital marketing for retailers. It’s time for it. The NAU platform directly connects retailers with customers through exclusive offers, bonus or discounts (depending on the strategy). Moreover, the reward for these leads goes to other users, not middlemen, delivering faster platform community growth. Every retailer gets users from the same interface, and the global aim of the platform is to create long lasting mutually beneficial relations between publishers, retailers and customers. 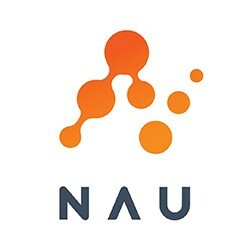 NAU is technically a platform featuring API and mobile app, which is the main entry point for users. To start using NAU, a user will download an application, sign up and set up his/her account. After that the user immediately gets access to all offers available, that are divided into 5 main categories and are displayed based on the user’s current location. By inviting other users (friends, colleagues or social media followers) to NAU, the user receives 95% of what the advertiser pays in tokens for each offer redemption. This will be disruptive for the current market paradigm, where middlemen share the advertising money and users have almost zero motivation to recommend and share within their social circles online, because there is no reward for doing so. By creating direct customer-retailer connection where the rewards are left within this interaction, NAU creates ​a ​new ​reality ​for ​both ​consumers ​and ​retailers. The platform keeps 5% of what retailers pay for each redemption of their offers. 95% goes to an affiliate – a user referring another user who has redeemed an offer. This means 95% of funds spent by retailers to attract new customers go exactly to those who fulfil this attraction. This creates additional motivation for users and increases platform use within consumer communities. NAU provides retailers with a flexible customer attraction tool. NAU enables retailers to create and push highly-targeted individual offers to a market segment of users, based on their experience within NAU platform and its geo-location approach. Users personal information is not disclosed to retailers, but platform tools allow retailers to personalise the message and the offer itself based on their user journey within the NAU Users can choose not to share their data and therefore not receive offers personalised to them, should they wish. NAU removes the high market entry cost for campaigns. The minimum amount to start a campaign with one offer is 10 tokens, which is 100% affordable even for the smallest retailer (the first million registered NAU retailers will receive 10 tokens as a free signup bonus). NAU makes user and publisher’s king of the platform. Users/affiliates receive 95% of retailers’ payments in tokens. By referring an active special-offer user, the affiliate receives lifetime profits from his/her activities, making it very attractive for sharing with your network and for driving targeted traffic to NAU. This is one of the core competitive advantages of the platform, as being viral by nature, it will increase its user base much faster. NAU enables marketing agencies and independent marketers to become certified agents for attracting, onboarding and managing local and nationwide retailers. Using NAU as a platform, agencies can build relationships with retailers they sign up – whether it is a fixed monthly commission or a price premium to each NAU token spent to pay for offer redemption or push-in notifying the selected audience. NAU’s aim is to fully outsource the management of retailers to certified partners and concentrate on developing the platform and making it a powerful marketing tool available both directly to retailers who wish to manage everything by themselves and for those who prefer to hire marketing professionals to do this for them. NAU utilises everything that makes the SoLoMo marketing solution beneficial and successful. NAU platform delivers lifetime referral commission for those who bring customers to NAU, making the social connection function even more rewarding for every single user. This win-win approach allows retailers and customers communities to empower each other: users are entitled to the exclusive offers they love, they can also get rewarded by retailers for referring friends, colleagues or social media followers, while retailers can boost their sales using an affordable and flexible marketing and customer acquisition strategy. 20 million tokens to be distributed between project advisors with 12 months lock-up period. 10 million tokens to the advertisers’ promotion fund (10 tokens/new advertiser). 10 million tokens to the users’ promotion fund (1 token/new user signed under invite). 5 million tokens are reserved for the bounty-program participants. After the main round of token sale is over, additional 24% of the overall sold amount will be sent to a separate smart contract. These tokens will become available by 1% each month starting from the 7th month after token sale completion – this is the founding team reward vesting program. Considering the projected income of $2,911,980 during this period, NAU needs funding of $5,001,319, ​which ​is ​NAU ​token ​sale ​planned ​minimal ​cap. Token Sale contributors will receive their ERC20 eNAU tokens or NAU tokens (if they choose the exchange option in their account) within 7 days after the end of Token Sale.